Over the last few days Edie has developed a sore back foot. At first I thought she was being messy with her food, but then realised it wasn't food it was blood. It is always along the front of her cage, as if she is pacing. I have examined all feet, one of er back feet is sore. 2 days ago the skin was raw, I wondered if it were a hunger thing so upped her food and she ate most of it, no blood in the newspaper this morning. However, got in from work half hour ago, went to check and again blood at the front of her cage - I got her out, again it is the same foot although not so red looking. Could it be a blister? Is she pacing because she wants to go to the wild? There is no blood anywhere else, just along the front. Hi Trish. Sorry to hear her foot is bleeding. It could be a number of things. She may have cut her foot just a bit, but when she paced up and down she may have made it worse, which is why it started bleeding. You are right, it could be a blister from walking up and down so much. Maybe the blister popped? The mixture of food, water and their waste could also have made it worse, if there is an open wound it could get infected. I would keep a close eye on the foot to try and see what's going on with it. Sorry Trish, I'm not really an expert on this, but you are right when you say she might be pacing because she wants to be released. These are wild animals after all. One of mine used to do that a lot and we wondered what it was at first. She would chew the wood and all sorts to try and get out. In the end we had to give her a better, bigger cage. She has the biggest of the cages. I am going to bathe her foot in diluted Savlon liquid and see how it goes. If need be, then as soon as the weather is better she wil be released in the garden, we are going to check the fence that separates us from next door as their dog is horrible and likes killing small animals. Not a big garden but it will be wilder than being in a cage. Sore foot has had a good clean with diluted Savlon, the others also had a quick clean too, just to be sure they are OK.
Couldn't see any blood when I changed paper and bedding this morning, had a look at her foot and already it looks much better. Do you have an idea of what it was and what caused it? The only thing that I can think is the shredded paper I got from the school office - a stray staple maybe. It just seems such a coincidence that I have used shredded paper we do, and family do for me and all is fine, then a bag full from school and I get a hedgie with a sore foot. Hmm. There have been cases of that in the past. I hope it heals soon. Not looked yet Ron, just been to put their food in, will go back a little later to re-examine and treat with Savlon. No blood on the paper although she has clearly been busy! I knew by the paper that her foot was sore again. I had a look, and while it is red, sore and raw looking, the size of the sore bit is smaller. It has been Savloned again, and will do it again this evening. I have come to the conclusion that us hedgehog carers need extra hands!! Luckily for me my husband helps, he is out this morning so my 8 year old son helped! Edie's foot has just been Savloned again, I have put a little Lavender essential oil on a tissue on top of her cage in the slight hope this will calm her a little and hopefully stop the pacing - it is quite clear she is pacing to and from at the front of her cage as when there is evidence of blood there is a 3 inch or so strip along the front, and none else where. As soon as the weather allows I think she will be better off in the wild. She has to go sometime and if her going sooner than planned will make her happy then that is what I will do. She weighs 620g, was more but has lost 40g over the last couple of days - all the pacing has done that I think. bless her and she'll soon put the weight back on. lucy has developed sore patches on her feet too, i think hers is due to being on fleece though, but i can't put anything else down, as she just tends to fall asleep where she falls down and gets cold also. i've bought some liquid savlon and will try that. As much as I would love to keep her here a while longer, it upsets to me to feel she is not happy. It is clear she is pacing. My instinct says let her go where she can be a wild, free hedgehog, but I don't want to do the wrong thing. Well, when there is a mild spell, she might want to be released. 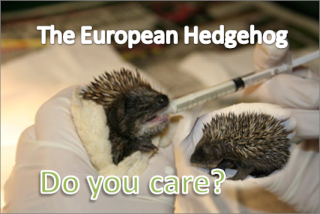 Most say you should release Hedgehogs in April, or around then, but if the weather is OK, then it is down to you. Trish wrote: As much as I would love to keep her here a while longer, it upsets to me to feel she is not happy. It is clear she is pacing. We never release hedgehogs without looking at the longer term weather forecast to make sure there are going to be several frost-free days and nights otherwise they may be caught out in freezing weather with no nest. Edie won't be going anywhere until the weather is set to be mild for a while, I constantly look at forecasts. I have started her on another course of wormer, won't hurt. She has had her foot savloned, has had some wormer orally I put the rest on her food. Has vitamins too which is normal. The extra heat is off, and I have put a drop of lavender on a tissue nearby. Edie is very lucky to have you. Is there any blood this morning? Or has it stopped. There was no blood on the newspaper this morning, but her foot is still a little raw so the savlon is continuing. I have started her on a course of wormer again, and the weight loss has stopped. If she has a few worms that could make her restless.